Years ago, in the pre-mobile phone era, or even in the roaming-is-so-expensive-you-don’t-dare era, I used to do a lot of business travel. And Sally and I used to take vacations. For each of these, I would prepare a list of travel information and contacts for those left behind – Sally if I was on business, our kids or their babysitters if we were on vacation without them. This would include flights, hotels and phone numbers, contacts at my offices if I was on business and their contacts, etc. This would enable someone to get in touch with me / us in the event of an emergency. With the dawn of mobile communications, global email and texting, this became a much less intensive and critical exercise. Now when we travel for pleasure, we usually let the kids know what our flights are, and generally where we’ll be. And of course, since I’ve been blogging our major trips, all of you are kept up to date with our location as we go along. This all changes for Africa. For one thing, we probably won’t have cell service most of the time. When we’ve traveled to Europe recently, we were able to (one way or another) tap into the local cell networks either with a wifi hot spot or directly with our mobile phones, as AT&T (and Verizon) have made roaming affordable. Neither one has any local partners in South Africa or Botswana that I can see. We will have wifi in our city hotels, so we’ll be able to communicate when we are there. But while out and about, we’ll be mostly non-communicating. I will look into getting a local SIM card for my allegedly unlocked iPhone while we’re in Johannesberg and Capetown, but I’m skeptical that it will work. In addition to the cities (Johannesberg, Cape Town and Victoria Falls) we’ll be in four different camps on this trip. Two of them have no Internet connectivity whatsoever. So for the first time in many years, we will be completely off the grid. If I remember correctly, the most recent time we were even close to this was in Anguila about 12 years ago. There was no cell service, no wifi, and no phone in our room. There was a phone near the front desk that you could use, and I recall having to make some business-related calls while we were there. In addition to the two camps that are explicit about having no wifi, I’m expecting wifi to be limited at the other two camps. While texts and emails might get through, I’m doubtful that I’ll be able to upload any pictures. And we have been in many city hotels where the wifi was barely useful in recent years. But maybe I’ll be pleasantly surprised. In any event, I have created a two page schedule of our flights and accomodations which I’ll leave with our kids before we go. Not that I expect them to need it. Unlike years past, this list doesn’t have phone numbers or addresses for our accomodations, nor the scheduled times for our flights. Rather, I just give the web link for each and expect anyone who wants to get more information – and up-to-date information – will just hit the link. 1. We are allowed a total of 44 lbs. 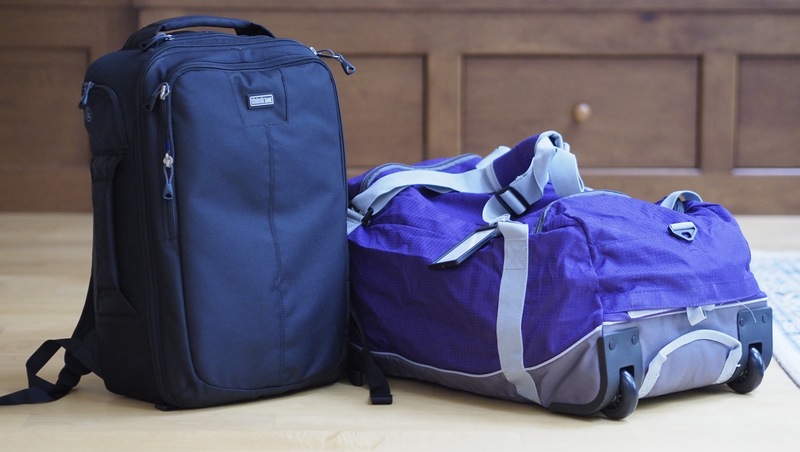 of luggage for both cabin luggage and checked luggage. 2. Our luggage must be softsided and without wheels. 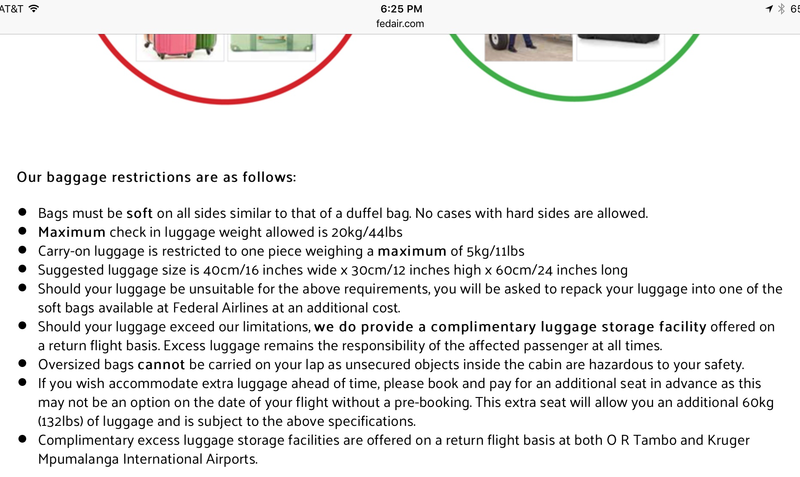 Maximum size is 24″ x 16″ x 12″ (Federal Airways). 3. We are allowed a single piece of cabin luggage not to exceed 8kg or 17.6 lbs., plus “1 small handbag or small laptop” (South African Airways), or a single piece up to 5kg or 11 lbs. (Federal Airways). 4. We can carry no more than four spare lithium batteries in cabin baggage (British Airways), and (of course) cannot pack any in checked luggage. 5. The unscheduled charters are apparently both more and less flexible. They do insist on soft luggage with no wheels, but apparently will accept whatever they can shove into the luggage compartment of the plane. These restrictions pose a challenge to many travelers, but especially those carrying a fair amount of sensitive electronic equipment. Like my camera kit. Let’s start with the overall weight restrictions. On our last trip, the cruise with Matteo and Zelda, my checked bag checked in at 38 lbs. I had a carry-on backpack with my camera gear and other essentials, like meds, iPad/iPhone, etc. that weighed about 15 lbs. for that trip, as the camera kit was very modest – some lenses, a backup (and small) backup body, and a bunch of batteries. No tripod. I did have a suit and dress shoes, etc. So about 9 lbs. overweight (38 + 15 = 53 vs. 44) in total when compared to the safari, and also 4 lbs. over for the carry-on. This Africa trip will require clothing for two environments: we’ll be in the city for eight days, and in camps/lodges in the bush for nine days. The city clothing is normal sightseeing stuff: very casual during the day for sightseeing, and some nicer casual stuff for dinners in the evening. The bush clothing is basically hiking clothes: neutral or earthtones so as to not scare the animals (1), warm layers as it’s winter in Southern Africa, hats to block the sun, sturdy hiking shoes or boots, etc. Unlike the cruise, no need for a suit and tie, fancy dresses, high heels, etc. We will have complimentary laundry during our time in the camps, but also need to deal with four days in a hotel in Cape Town. So it’s a balancing act: bring enough stuff to last the one long city stay, or stuff that can be hand-washed in the room (2). Then there’s the big elephant in the room, so to speak: my camera gear. The kit for the cruise totaled 12 lbs., and more than 3 lbs. went in my checked bag. But that trip, while interesting photographically, was not focused on photography, was with three other non-photographers, and was mostly to places I’d been recently. So I knew in advance that the photography I did would be opportunistic and not involve a lot of setup for any shot. In particular, no tripod and a minimal set of lenses. Some days I didn’t even bring a camera bag out, just a camera, an extra lens, and an extra battery. For this trip, the current estimate for the camera kit is 24 lbs. – a full 12 lbs. more than last time. I’ll talk some more about this in a future post. But this leaves me needing to find 23 lbs. to take out of the other stuff I brought on the cruise. I already have the suit and it’s accessories, which is about 5 lbs. The other big save is the checked bag itself. As we’re required to use a soft bag for our checked luggage on this trip, we don’t need our lightweight Tumi rolling luggage at 12.5 lbs. instead, we’ll each be using a duffle bag supplied by our travel agent which weighs about 2.2 lbs. Those two alone save me 15 lbs. – the need for different stuff for different situations. – The inability to obtain new stuff for most of the trip. On this trip, we’re in cosmopolitan cities and the bush; we’re in warm weather (high of 82F and bright sun) and cold (low 40s pre-dawn while on a game drive in an open vehicle). So we need everything from t-shirts to long underwear, insulated jackets, gloves and warm hats. We’re also in safari camps/lodges for as much as 6 consecutive days, followed by two days in the small town of Victoria, Zimbabwe. We really can’t count on being able to buy anything that we might have forgotten, lost or broken. This includes, of course, meds and toiletries. Given this, we’re both carrying at least a four weeks supply of all of these critical consumables. While this may not sound like much, my daily meds in the weekly cases add up to about a pound for four weeks. Anyway, I’ve gotten my non-photography/electronics gear including the duffle bag down to about 18 lbs. or so. With the camera kit at around 24 lbs., I’m currently just two pounds under my limit assuming I haven’t forgotten anything, and I’m sure I’ve forgotten something(s). (1) One is universally advised to wear khaki-colored or other neutral colors while on game drives. Yet I’ve been given to understand that many of the animals, including lions, are colorblind. But maybe some can see colors. In any event, we both have appropriately bland stuff. (2) One could also pay for hotel laundry, but you’d spend less money discarding the soiled items and buying new ones. I’m not particularly adverse to hand-washing myself, but Sally is less fond of it. (3) It was no issue when I traveled alone for business, of course; then I didn’t care if I had wet stuff all over, and I was rarely in my hotel and awake.